Poor weather conditions could hamper a record-breaking attempt to cross the Pacific Ocean using a solar-powered plane. 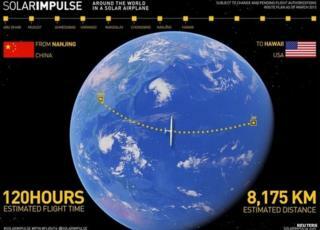 The Solar Impulse craft is a day into what was expected to be a 130-hour journey from China to Hawaii. However, meteorologists say the forecast is worsening. They have asked the pilot to stay in a holding pattern while they decide whether he should continue or turn back towards land. They will reassess the situation at a team briefing at 08:00 GMT Monday. This is the seventh leg in an attempt to circumnavigate the globe using just the energy of the Sun. The experimental craft, which is covered in 17,000 solar cells, took off from Abu Dhabi in March. The Pacific crossing, however, was always going to be the most challenging part of this epic journey. The team has already had to wait for a month in Nanjing for the right weather conditions to take off. The plane not only needs favourable winds to push forwards, it also needs cloud-free skies during the day to soak up enough energy from the sun to enable it to fly during the night. Media captionAndre Borschberg: "I wouldn't leave if I had doubts"
The team's meteorologists thought they had identified a suitable weather window - and the plane set off at 18:39 GMT on Saturday. Swiss pilot Andre Borschberg, who is flying solo, had been making good progress, however a weather front could now pose problems. Solar Impulse's Bertrand Piccard, who has been monitoring the flight from mission control in Monaco, said: "Yesterday we had the possibility to cross the weather front just before Hawaii on day five. "However, with the forecasts we now have, we don't see this possibility anymore, which means that for the moment the road to Hawaii is blocked. "We need all the data from the next weather forecasts, so that our weather experts can analyse what's going to happen in the next four to five days." The plane is currently in a holding pattern over the Sea of Japan. For now, this is the safest thing to do - if the craft flies past a certain point, were anything to go wrong, the pilot would have to bail out into the ocean. 'We have asked Andre to stay where he is: it's fine, the weather is good and the batteries are charging," added Mr Piccard. The team will now have to decide whether to press on with the flight, or abort the attempt and head back to land to await clearer skies. The fear is that further delays could have an impact on the later stages of the flight. Ideally, the team needs to cross the United States, and then the Atlantic, before the hurricane season starts to peak in August. Who, what, why: Is surviving on 20-minute naps bad for you?